Last weekend, I decided to finally test Ushahidi Crowdmap and sync it with FrontlineSMS. It turned out to be a great learning experience and really got me thinking about how these combined applications could be used. There is an upcoming project where these applications may prove very beneficial. FrontlineSMS is quite familiar to me as I’ve conducted a lot of testing and also serve as a FLSMS forum support volunteer. Furthermore, Ushahidi and specifically the Crowdmap (the Ushahidi in-the-cloud service) application have always been of interest to me. There have been several Ushahidi deployments that have garnered global attention, one notable example is “Project 4636” for crisismapping following the earthquake in Haiti in January 2010. The Ushahidi blog has a nice detailed graphic summarizing the dataflow of Project 4636. 1) Syncing FrontlineSMS to Crowdmap. 2) Gain more experience with the Crowdmap configuration. 3) Receive SMS messages into Crowdmap, analyze the reports and plug in the user supplied location data for mapping. 4) Receive Tweets tagged with #flsms2ush, with user supplied location data and map those reports. On the Ushahidi blog there’s a helpful write up of instructions on how to sync FrontlineSMS to Crowdmap. Here’s my Crowdmap site, with the results of the SMS messages from FrontlineSMS and all tweets tagged with #flsms2ush, of course location data was provided in the txts and the Tweets. Finally, this turned into a wonderful learning experience for both applications and it allowed me to gain a better understanding of how they compliment each other. In addition, there’s a good possibility I’ll be making use of FrontlineSMS and Crowdmap in an upcoming public health project. I’ve been trying to get my own installation of Ushahidi up and running. How did you manage to send text messages through FrontlineSMS? Did you pay for one of the two services (clickatell and the intellisms) or find a phone or GSM card? Thanks for your comments. 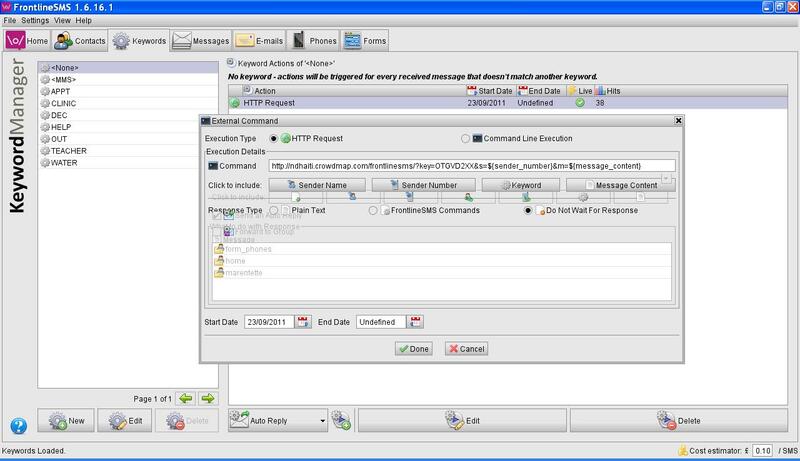 I used a GSM modem to pass the SMS messages to Crowdmap using FrontlineSMS, though I have done testing in the past using Intellisms as the bulk SMS provider to hand off to FrontlineSMS. Have you tried setting up Crowdmap? It’s the cloud deployment of Ushahidi and was really quite easy to get going. If you need any additional details, let me know, I’m happy to help. Ugh, hi Matt…..don’t know how I missed this comment. Let’s talk more if you are interested. Where are you located? Once again, sorry about missing this. As you know, I’ve been wondering about using this combination in a BOSCO context. I’m particularly interested in creating maps like this one (http://tinyurl.com/boscoplants), where users associate rich content (images, stories, anything you can put on a blog post or a wiki page) with geographical locations, the map then serving as something of a table of contents. (Eventually I’d like to add time data so that users could watch temporal change in the parameter of their choice in Google Earth.) To get the maps we’ve generated thus far, we use an embedded Google form, some transformations of input parameters inside the spreadsheet, and then map-a-list to autogenerate the map and changes, all this embedded in a wiki. So my question is, how could we utilize FSMS and Ushahidi to accomplish any of this differently? What would the advantages be of such a system? If phones were smart enough to send a pic message with text from audio, you could map blog posts sent from a mobile device. Aside from the connectivity and device cost issues on the user side, does the FSMS/Ushahidi mashup have the capability to receive and map such input? Thanks for your comment on my TC105 post and for directing me to this piece–I’ve been planning to do a similar test since the “SMS to Map” event, so reading about your experience was really helpful! I’ve recently been focusing on learning more about eHealth (my background is more in eLearning), and I’m wondering if you might be able to share a bit more about how you’ve used (or could see using) FLSMS and Ushahidi together to support public health initiatives? Thanks! Sorry about the slow reply. I’d just now catching up. Thank you for your comments, much appreciated. Yes, I’d love to speak more about this. I’m certainly no expert, but good things come out of sharing experiences. I’m following you on Twitter now, so maybe we can connect next week via Skype to chat about these topics. Could you help me with this problem éclairssir please??? thanks for your comments Frederick. I’ll follow up with an email. My apologies for the slow response.